Newport, Rhode Island is steeped in colonial history. Visitors who have explored Newport’s Old Quarter can’t miss the hundreds of 18th century buildings that make the city a unique heritage tourism destination. It’s only natural that the Newport Historical Society, which owns or oversees five colonial properties and possesses a rich collection of colonial artifacts and documents, is planning a large scale living history experience. To commemorate one of the first major events that led to the American Revolution, the 1765 Stamp Act protests, the Society will host a team of living history reenactors to mark this historic event through the following afternoon activities. • Members of the Sons of Liberty will make an effigy and prepare for the protest. • Martin Howard, a Newport citizen loyal to the Crown who was targeted during this protest. • John Robinson, the Customs Collector and Crown Official who was caught up in the activity. • Mrs. Vernon and Mrs. Ellery, wives of the city’s leading merchants and Sons of Liberty. • Mr. Ellery, Mr. Vernon and one assistant “guard” the effigy. • The living history interpretation stations are still running, and wandering interpreters can still be found around the Square. • The effigy is torn down. • Loyalists Martin Howard and John Robinson are confronted. The rabble rousers who initiated the Stamp Act Protest recruited participants by serving them “strong drink and Cheshire cheese.” Following the afternoon protest reenactment, join the interpreters for a Stamp Act Party in the spirit of the 18th century. 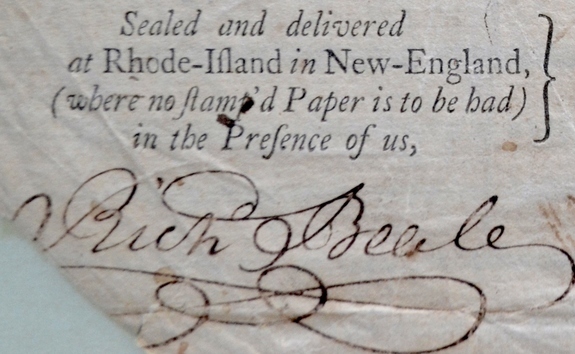 Learn about the conclusion of the Stamp Act in Newport, including a historic twist causing extra ruckus. Sample Newport Storm beer along with cheese presented by Narragansett Creamery. Loyalists shouldn’t shy away from this party as they can enjoy tea from Empire Tea + Coffee. Modern hors d'oeuvres will also be available, along with other refreshments. Admission to the Stamp Act Protest is free; donations to the Museum of Newport History (127 Thames Street) to support the event are welcome. Tickets to the Stamp Act Party cost $25 per person, $20 NHS members at: http://StampAct.Eventbrite.com.